[Streetstyle] Men: how to style curly hair? The editorial board really fell in love with our Streetstyle model of the day's look! Modern and sophisticated, he has a haircut which perfectly enhances his features. Furthermore, he knows how to perfectly mix current trends. We take a closer look at his style. Our Streetstyle model has a layered cut which enhances his curly hair. The sides are shaved to reduce the amount of hair and so the hair is out of his face. However, it has been left long on top of the head, allowing the curls to stand out. 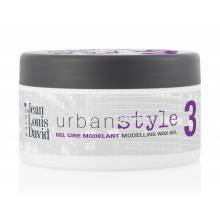 The curls have movement on the side, which is fixed by a small amount of gel. However, the hair isn't structured by a parting. As for colour, our Streetstyle has naturally dark brown hair. He is fully embracing the appearance of his first grey hairs and has pepper and salt hair which contributes to his charm. Men: how to style curly hair? Our Streetstyle model is a fashion enthusiast and therefore knows all of the must-have styles to adopt this season. In fact, nothing is left to chance! 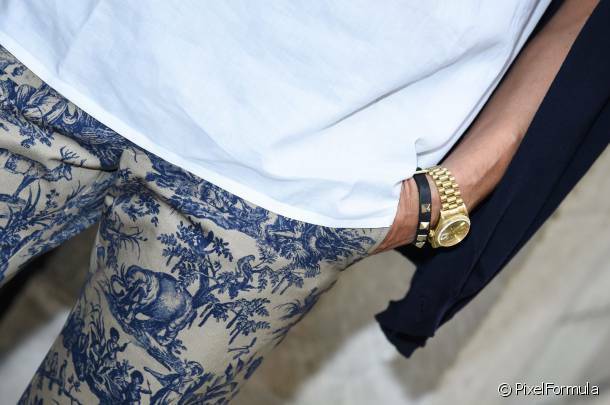 His entire outfit is coordinated to perfection: he wears blue and off-white scarf print trousers. He has combined them with a white shirt, which is buttoned up to the neck and adds a preppy touch to his look. Finally, he has completed the whole look with a large navy blue jacket, simply placed on his shoulders. As far as accessories are concerned, our Streetstyle model has also pulled out all the stops! He has opted for a navy blue shoulder bag which is one of the flagship products for men this year. 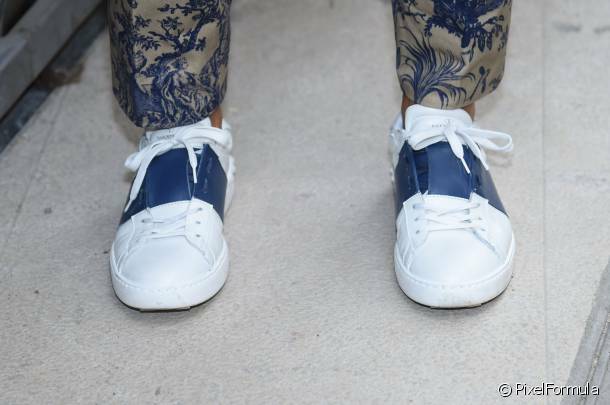 As for his pair of white and blue tennis shoes, they match perfectly with his trousers. His oversized sunglasses boost his style even more. Not forgetting his golden watch, which elegantly completes the outfit.